Blowing the lid off convention and setting a new precedence, the state residents of Colorado and Washington voted in recent elections to make it legal to buy, possess and recreationally use marijuana. Other states such as California have made it legal for those with specific medical prescriptions to legally purchase certain amounts of the drug for medical use only. Despite its legality in these states, buying, owning and consuming marijuana remains a federal crime. As such, it is easy to see how the new laws are causing widespread confusion. Even within these respective states, USA Today states that legal and regulatory problems are arising with regard to where you can smoke and buy it. For instance, you can smoke it in your home or on private property, but it is still regulated in public places. Unless otherwise stated smoking marijuana is prohibited in businesses, public parks, schools, Universities, and much more. This is why proper signage regarding this new and widely misunderstood marijuana law is so important. 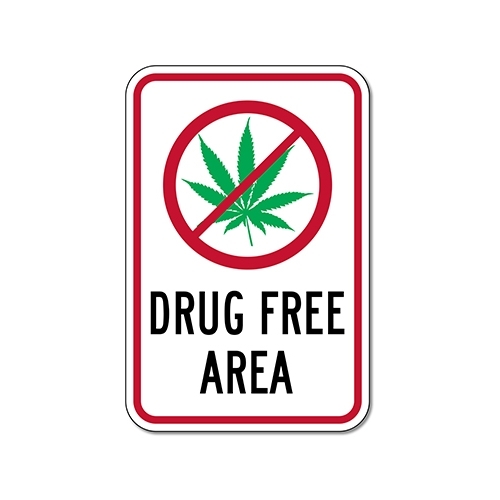 Some people may incorrectly think they can light up wherever they want, which is why posting “No Smoking” or “Drug Free Area” with a slash through a marijuana plant leaf, is important. Without proper signage, it is more difficult to enforce such regulations. Posting such signs might be especially significant to property managers of organizations that serve children or young adults as buying, possessing and using marijuana is only permitted by those ages 21 or above, similar to alcohol. Because these laws are so new, it is no wonder they are causing so much misunderstanding about how they are to be interpreted. 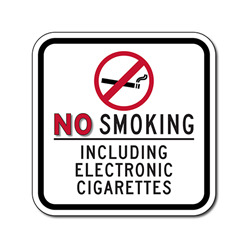 You can help customers, guests, and passersby of your business or organization by posting “Drug Free” signs in the same way you would post “No Smoking Signs.” Though thus far only two states have legalized use of the drug, it is possible other states may choose to do so in the future.